Six months before the annual French Hobie Cat® 16 Classic Championships which will hold from the 11th to the 13th of November 2016 on the Lake of Carcans-Maubuisson (Gironde), the French Hobie® Championships 2016 held in Lancieux (Côte d’Emeraude) between the 14th and the 16th of May. Sixty boats were registered. 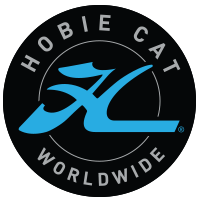 Among them: Wild Cat, Tiger, Hobie Cat 14, Hobie Cat 15, Hobie Cat 16 (SPI), Hobie Cat 16 (Classic). Unfortunately, Wild Cat and Tiger were under-represented with only one boat in each class. We invite ALL sailors on Tiger and Wild Cat to take part of the event in 2017! 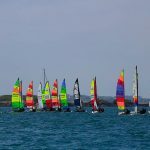 Once again this year, the French Hobie Championships attracted sailors from all over France and top-class sailors, as Thierry Morfret and Gwënael Roth, Hobie Cat 16 world champion in 1997. The conviviality of this annual event also allowed youngest to demonstrate their talent or to discover the Hobie way of life. Three races in each class are sailed under sunshine and hot weather. From the first day, Arthur Boc-Ho and Thibault Chauveau take the first place way ahead of others competitors of Hobie Cat 16 (SPI and Classic cofounded). A welcome drink is offered to competitors to open the Championships at the end of the day. 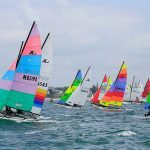 Three races in each class are sailed despite light airs. In the Hobie Cat 16 class, the gap between the first two crews reduce, but Arthur and Thibault maintain their first place ahead Alexandre Molina and Vianney Salvi. In the Hobie Cat 15 class, Charles Dufour and Yannis Brin keep their first place. They lead the series by a clear three points. In the evening, the traditional meal for crews offers a wonderful seafood buffet in a friendly atmosphere, and give the opportunity to sailors to exchange their feeling and technical advice. At the end of these 3 days of competition, Arthur Boc-Ho and Thibault Chauveau top the first place in the category Hobie Cat 16 SPI (and SPI and Classic cofounded), Pierre Arbona and Brigitte Arbona top the first place in the category Hobie Cat 16 Classic, Siguret Ludovic top the first place in the category Hobie Cat 14, Charles Dufour and Yannis Brin top the first place in the category Hobie Cat 15. The competition ends by the award ceremony and a friendship drink. In 2017, the French Hobie Championships will hold in Châtelaillon Beach (Charente Maritime) and will be organized by the Châtelaillon Sailing Club. 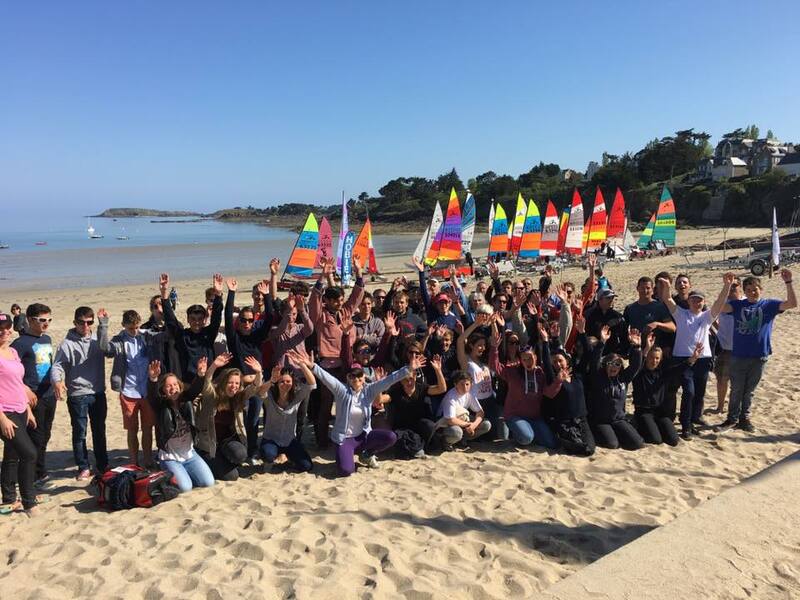 At this occasion, France will took the opportunity to celebrate the 50th anniversary of Hobie Cat. Since 2015, the Châtelaillon Sailing Club organizes the Chatel Hobie Cup, gathering sailors from any level. The enthusiasm, dynamism and Hobie spirit of sailors of the Club promise a real great event in a wonderful environment! See you at the French Championships 2017!